Build It. Share It. Profit. Can Open Source Hardware Work? 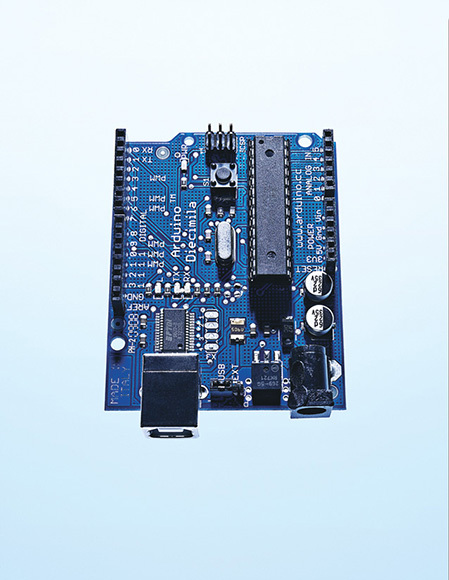 A circuit board for the masses: the Arduino microcontroller. Check this out," Massimo Banzi says. The burly, bearded engineer wanders over to inspect a chipmaking robot—a "pick and place" machine the size of a pizza oven. It hums with activity, grabbing teensy electronic parts and stabbing them into position on a circuit board like a hyperactive chicken pecking for seeds. We're standing in a one-room fabrication factory used by Arduino, the Italian firm that makes this circuit board, a hot commodity among DIY gadget-builders. The electronics factory is one of the most picturesque in existence, nestled in the medieval foothills of Milan, with birdsong floating in through the open doors and plenty of coffee breaks for the white-coated staff. But today Banzi is all business. He's showing off his operation to a group of potential customers from Arizona. Banzi scoops up one of the boards and points to the tiny map of Italy emblazoned on it. "See? Italian manufacturing quality!" he says, laughing. "That's why everyone likes us!" Indeed, 50,000 Arduino units have been sold worldwide since mass production began two years ago. Those are small numbers by Intel standards but large for a startup outfit in a highly specialized market. What's really remarkable, though, is Arduino's business model: The team has created a company based on giving everything away. On its Web site, it posts all its trade secrets for anyone to take—all the schematics, design files, and software for the Arduino board. Download them and you can manufacture an Arduino yourself; there are no patents. You can send the plans off to a Chinese factory, mass-produce the circuit boards, and sell them yourself — pocketing the profit without paying Banzi a penny in royalties. He won't sue you. Actually, he's sort of hoping you'll do it.